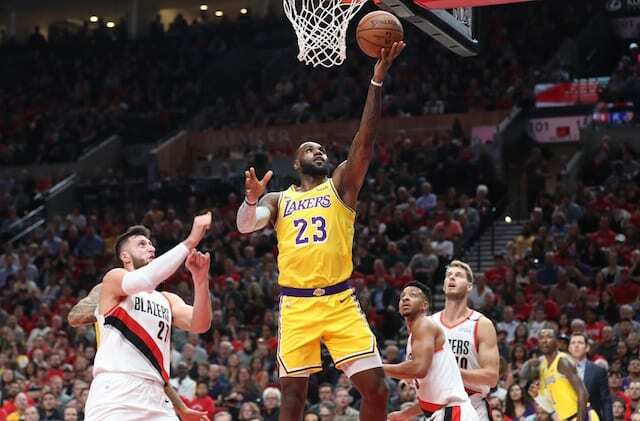 The LeBron James era began in full earnest as the Los Angeles Lakers were out to an encouraging start but faded and came up short in comeback attempt, resulting in a 128-119 loss to the Portland Trail Blazers. The win was Portland’s 18th consecutive in a home opener, which is an NBA record. James finished with 26 points, 12 rebounds and 6 assists. His first impact on the game was to find Brandon Ingram for a layup, and James then proceeded to launch his own paint-centric assault on the basket. Kyle Kuzma was the Lakers’ first play off the bench and he initially managed to hold his own while playing center. The Lakers jumped out to a 25-15 lead but found themselves trailing by three points at the end of the first quarter. Some of that was related to a failure to connect on any of their seven attempts from deep. Their subpar shooting carried into the second quarter and was particularly troublesome as Nik Stauskas caught fire to lead the Blazers in building out a lead of their own. Similar to what he demonstrated during the preseason, Brandon Ingram saw plenty of success in the second half. He made the Lakers’ first two shots out of halftime and scored 10 of their 13 points to help cut the Trail Blazers’ lead to a single possession. Ingram’s strong stretch was followed by a flurry of activity by Josh Hart, who was responsible for making the teams first 3-pointer after they missed 15 previous attempts. It gave the Lakers an 85-83 lead with just over two minutes remaining, and though Hart connected again from deep, the Lakers went into the fourth quarter trailing 93-91. After they fell behind by six points, Lonzo Ball’s 3-pointer pulled the Lakers to within a point. However, Damian Lillard and Stauskas made back-to-back attempts from deep, to force Lakers head coach Luke Walton to call a timeout. Lillard scored a game-high 28 points. The spurt created enough separation and Portland proceeded to blow the game open from that point. 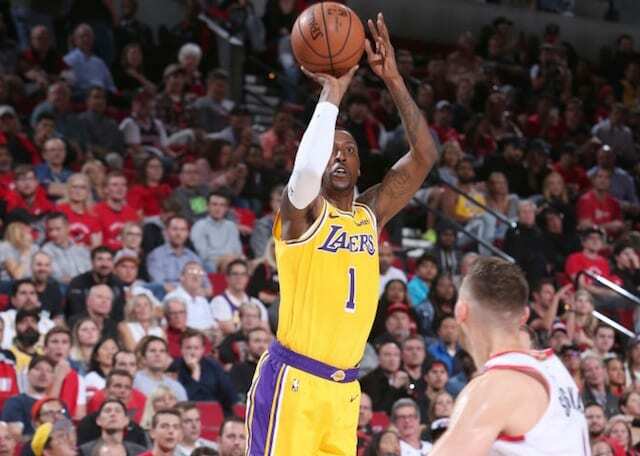 A lineup of Rajon Rondo, Hart, Ingram, James and Kuzma made a late charge but were thwarted by empty possessions. Their shooting struggles not withstanding, the Lakers did excel in pushing the pace as they outscored the Trail Blazers in fast break points, 31-12. Moreover, Los Angeles did limit themselves to a relatively acceptable 14 turnovers.